So I'm putting together a Compline booklet mainly for my wife and I, but I want to make it accessible to others if we have the opportunity to say it with friends, etc. I'm having trouble deciding on how to format a visual aid to help people grasp the motion of the psalm tone used for a particular psalm (see the attached image, but please disregard how messy it all is). Are the single staffline options acceptable? Is it better to use the instructional language or the first psalm verse? Since early chant notation used just a single line, it did some good for those medievals: why not use it too if it works? Your single line staff is easily readable for us who know the tone inferred. It may not be as 'accessible' to non-musicians, or those who do not know the psalm tones, especially their various cadences, well. I would suggest using a two line staff as the Episcopalians have used successfully in The Hymnal 1982 and in their altar books. They use a flat sign on the upper line as a clef. The c clef which you use is just as good, if not better. I would strongly recommend this system, for it leaves no doubt as to the precise intervalic relationship of the pitches. 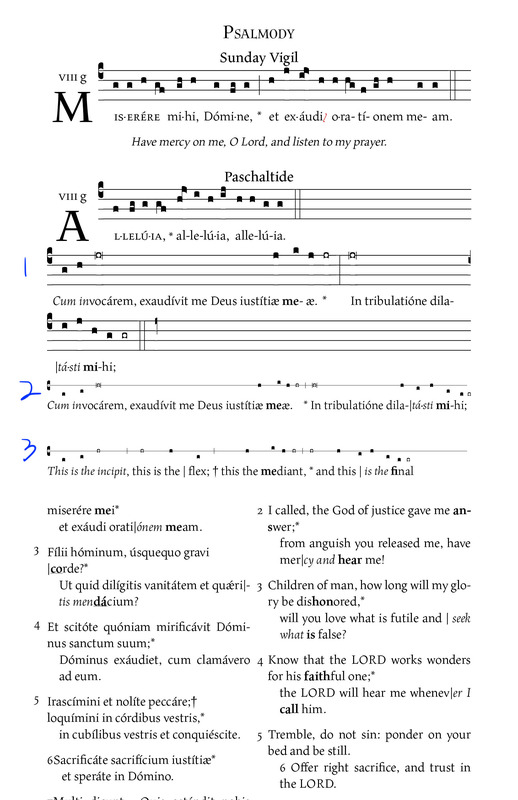 1 or 2 line staves are fine if you're notating the whole psalm, but why would one go from 5-line antiphon to a paradigm in a completely different notation to save so very little paper? Richard Mix does make a very strong point, namely, the lack of necessity musically to notate every psalm verse. This is normally accomplished by using italics or bold print (pointing) to indicate cadential syllables. After a while, having a notated staff between every verse becomes a distraction and an eyesore. My main desire in having the instructional line is just as a visual aid to help the untrained grasp the shape of the psalm tone as the various shifts are made, while I probably cantor the first verse, so the actual pitches should be made clear by my singing. In case someone asks for a copy, I might include properly notated formulae for the tones in the back. But what I want here is simply something that shows the motion to someone who will be hearing the discrete pitches. And the rest of the psalm will be pointed either way. I just haven't finished formatting it.